The break-up and sinking of Erika promises to bring changes to the way in which ships are- inspected and maintained. 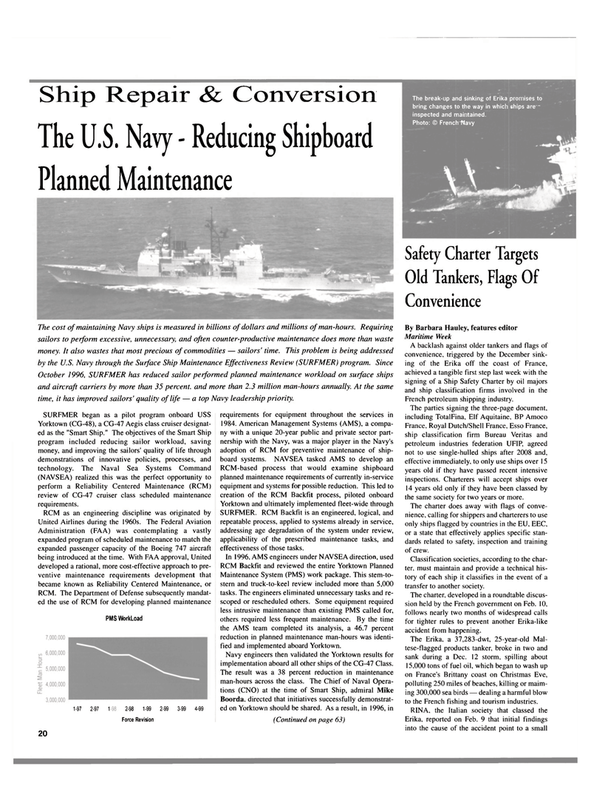 October 1996, SURFMER has reduced sailor performed planned maintenance workload on surface ships and aircraft carriers by more than 35 percent, and more than 2.3 million man-hours annually. At the same time, it has improved sailors' quality of life — a top Navy leadership priority. Yorktown (CG-48), a CG-47 Aegis class cruiser designat- ed as the "Smart Ship." The objectives of the Smart Ship program included reducing sailor workload, saving money, and improving the sailors' quality of life through demonstrations of innovative policies, processes, and technology. The Naval Sea Systems Command (NAVSEA) realized this was the perfect opportunity to perform a Reliability Centered Maintenance (RCM) review of CG-47 cruiser class scheduled maintenance requirements. SURFMER. RCM Backfit is an engineered, logical, and repeatable process, applied to systems already in service, addressing age degradation of the system under review, applicability of the prescribed maintenance tasks, and effectiveness of those tasks. Maintenance System (PMS) work package. This stem-to- stern and truck-to-keel review included more than 5,000 tasks. The engineers eliminated unnecessary tasks and re- scoped or rescheduled others. Some equipment required less intrusive maintenance than existing PMS called for, others required less frequent maintenance. By the time the AMS team completed its analysis, a 46.7 percent reduction in planned maintenance man-hours was identi- fied and implemented aboard Yorktown. Navy engineers then validated the Yorktown results for implementation aboard all other ships of the CG-47 Class. France, Royal Dutch/Shell France, Esso France, ship classification firm Bureau Veritas and petroleum industries federation UFIP, agreed not to use single-hulled ships after 2008 and, effective immediately, to only use ships over 15 years old if they have passed recent intensive inspections. Charterers will accept ships over 14 years old only if they have been classed by the same society for two years or more. The charter does away with flags of conve- nience, calling for shippers and charterers to use only ships flagged by countries in the EU, EEC, or a state that effectively applies specific stan- dards related to safety, inspection and training of crew. Classification societies, according to the char- ter, must maintain and provide a technical his- tory of each ship it classifies in the event of a transfer to another society. The charter, developed in a roundtable discus- sion held by the French government on Feb. 10, follows nearly two months of widespread calls for tighter rules to prevent another Erika-like accident from happening. The Erika, a 37,283-dwt, 25-year-old Mal- tese-flagged products tanker, broke in two and sank during a Dec. 12 storm, spilling about 15,000 tons of fuel oil, which began to wash up on France's Brittany coast on Christmas Eve, polluting 250 miles of beaches, killing or maim- ing 300,000 sea birds — dealing a harmful blow to the French fishing and tourism industries.